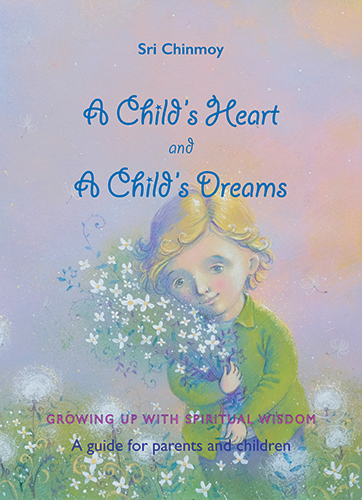 You can start a child’s spiritual journey at a very tender age — at six months even. Perhaps the child cannot utter a word, but, for example, if you are a Christian you can show him a picture of the Christ. God expresses Himself through beauty, so you can also show the child something beautiful, like a flower. A child can appreciate the beauty of a flower. At that time, the flower itself is God for the child. Then, when the child can speak, let him say ‘God’ a few times as his prayer. As he advances in years, he can be taught higher meditation. Sometimes parents ask me how they can describe to a small child something like prayer or meditation, which they feel is abstract. But for an adult, prayer and meditation are not abstract. When we pray, we fold our hands and cry inwardly to Someone who is above us or within us. If you want to explain prayer to a young child, do not try to convince him only with the physical. Tell him that prayer is something totally different from just folding his hands and looking up. Tell him that prayer is something that he has to do inside, but if he wants to see or feel it, then he has to fold his hands. You can tell a child that prayer is something which he will feel when he folds his hands and talks to God. Then, when he folds his hands and feels something within — whether it is awe or love or sweetness or softness — then for him prayer will no longer be abstract; it will be a reality. For meditation, the child has to sit calmly and quietly. When he sits like that, immediately he will begin to feel that he is meditating. This concrete action will take him into something which originally may seem abstract. You can teach a child through outer action, but do not neglect to emphasise the inner feeling. When he starts feeling joy, peace and love and gradually becomes these things on the strength of his meditation, how can they remain abstract? His body is not abstract to him because he identifies with his body. Whatever he identifies with, he claims as his own. If he identifies himself with prayer or meditation, he will feel peace, joy, love and so on. And once he feels these things, he gives form to them and they no longer remain abstract. Prayer and meditation are like two roads. Prayer is always done for our own sake, for our own life, for the near and dear ones in our own small world. But meditation is for the entire world. When we meditate well, we feel our oneness with our own expanded reality and fulfil not only ourselves but the entire world. Prayer is necessary and meditation is necessary. When I pray, I talk and my Father listen. When I meditate, my Father talks and listen. When we pray, we go up to God; when we meditate, God comes down to us. Ultimately it is the same. Right from childhood, we are taught to pray to God for everything. Our parents teach us to pray, but they do not teach us what to pray for. They say, “Pray to God for everything you want.” So, we start praying: “O God, please make me be first in the examination”; “O God, let me be first in the running race”; and so on. When we start praying for all these kinds of things, there is no end. Instead, parents should say to their children, “Pray to God to make your mind calm and quiet so that you will feel peace and bliss everywhere. Pray in the heart.” But unfortunately, the parents do not tell this to their children, so from early childhood, children pray for every silly thing. Still, it is certainly better to pray to God for silly things than not to think of God at all.